At Japanese hibachi restaurants you are first served a salad doused in a tangy, mildly sweet, ginger dressing before a skilled chef comes before you and prepares your food in Teppanyaki style. While you relish your salad the chef makes some performances like juggling utensils, tossing shrimps into the air and catching with his hat or tossing it directly to the diner's plates. Now these restaurants have become more popular with the foreigners rather than the Japanese due to the cuisine along with the performances of the skilled chefs. The salad served is a bowl of greens-lettuce and tomato and is a perfect appetizer. Whenever we used to dine out at such restaurants I tried to figure out the ingredients in the dressing but couldnt until I came across a cookbook during one of my visits to Barnes & Noble. 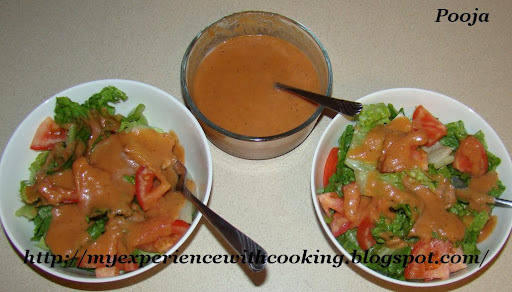 This dressing is very easy to make. You just need to toss all the ingredients mentioned below in a blender and blend it till the ginger has pureed. 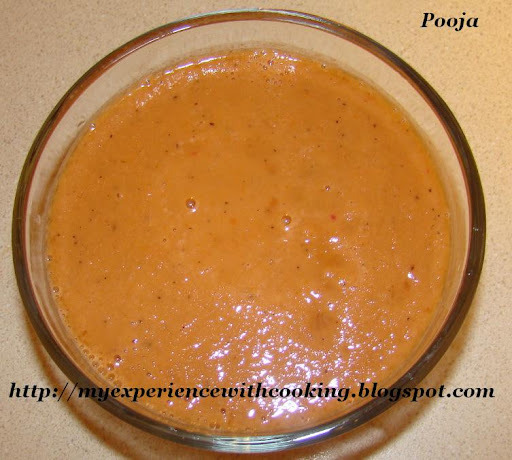 Combine all ingredients in a blender and blend it until the ginger has pureed. Chill before serving. This goes to AFAM Olives event hosted by Priya of Easy N Tasty Recipes and started by Maheswari.